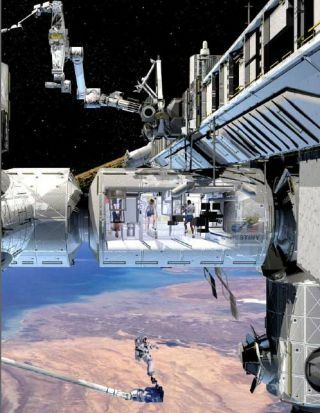 This cutaway view of an artist's rendering of the International Space Station shows a very busy crew inside and outside the orbital lab. The station's current three-person crew size is expected to double to six-person teams in spring 2009. Some new high-tech gear slated forlaunch this year will prepare the International Space Station (ISS) topermanently double its current three-astronaut population. A new toilet, a pair of astronautbedrooms and a handy new system that recyclesurine into pure, drinkable water are on the docket for a fallshuttle flight to the space station, where they?ll be tested before the outpostcan scale up to six-person crews next year. ?Our biggest question right now isgetting our life support systems working so we have enough for six-personcrew,? said NASA astronaut Mike Fincke, who will launch to the station in October to command the Expedition18 crew that will oversee the new equipment?s installation. ?Right now, we?rerunning kind of a water deficit and it?s being supplemented by the shuttle.? The station?s new Water ReclamationSystem, a refrigerator-sized filtration and recycler unit, is designed to easethat shuttle dependence and help make larger crews more self-sufficient. It isscheduled to launch alongside the new toilet and phone booth-sized sleepingchambers in November aboard NASA?s shuttle Endeavour, which will also ferryNASA astronaut Sandra Magnus to the station to join its Expedition 18 crew. ?By getting the crew quartersdeployed, we?ll have extra bedrooms,? Magnus said. The station?s Russian Zvezdaservice module currently contains the station?s main crew quarters. Life support from the toilet? The water recycling system distillsurine to recover its water, then feeds it into a processor along with otherwastewater to undergo a series of steps for filtration, treatment andpurification. Magnus told reporters last week thatshe and her crewmates will test water samples from the system for purity everyfour days for about three months. If all goes well, the system would helpsupport the station?s planned shift to a six-person crew late next spring. It can also be used to feed thestation?s U.S.-built oxygen generator, which uses electrolysis tosplit liquid water into breathable oxygen and waste hydrogen. Astronautsdelivered the generator in 2006 and tested it before shutting it down to awaitthe water recycling system?s delivery. ?That water is going to be used notjust for drinking and food preparation, but also for oxygen generation,? Finckesaid in the briefing last week. ?And I think that?s a key component of lifesupport because I think we?re all addicted to breathing.? Together the oxygen generator andwater recycler serve as the core of NASA?s Regenerative Environmental Controland Life Support System aboard the station. Working together, they are expectedto reduce the amount of regular water and supplies that have to be shipped tothe space station by about 15,000 pounds (6,800 kg) each year. That would beespecially vital once NASA?s main orbital workhorse, its aging three-spaceshuttle fleet, retires in 2010 to make way for the smaller Orion crew capsule. Each pound of supplies saved wouldallow another pound of science experiments or other equipment to fly, Finckeadded. "Recycling will be an essentialpart of daily life for future astronauts, whether on board the space station orliving on the moon," NASA?s space station program manager Mike Suffredinihas said. "Delivering this hardware is an important step in achieving thestation's full potential, allowing for additional crew members and morescientific research." The water recycler will be pluggedinto the brand new toilet, which is actually a Russian-built commode that NASA bought for $19 million to be installed in the station?sU.S. segment. A similar toilet has been inoperation in the station?s Russian Zvezda service module for the last sevenyears. When it broke down earlier this summer, NASA and Russia sent replacementparts up during a June space shuttle mission to repair it. ?The engineer and scientist in mesay, ?Yeah, it?s no problem. It?s probably purer water than most of what wedrink or ever have drunk before,?? Fincke said with a laugh. ?On the otherhand, it?s still kind of funny to know where that water?s been. It?s a goodthing we?re a close crew. ?